Recently when I spoke at a garden club I listened to the flower show judge comment on the various arrangements that members had brought in. Her comments were about how the displays would be judged in a formal flower show, of course…we are all free to put flowers together in any manner we want at home. But I was struck by her comment that the stamens of a lily should always be removed because they stain when they touch fabric (true) and “besides, they’re ugly.” The last remark is a matter of opinion. 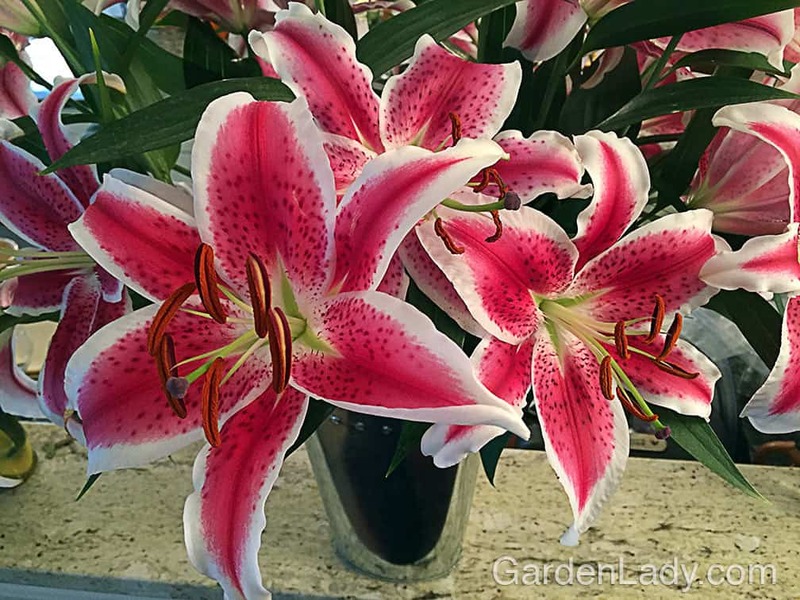 As I admire the lavish bunch of lilies that arrived last week from Stargazer Barn, I can’t help but think how much the stamens add to the total display. That dash of orange echoes the dots on the petals, and their shape adds a touch of lightness to an otherwise heavy flower. It’s a good thing that I’m not entering this fragrant bouquet in a flower show, because these flowers, stamens and all, make me smile. First prize for that. I think that the stamens add a great deal of drama to these flowers. And yes, I’m careful not to brush by them with light-colored clothing or have them positioned over a white couch.